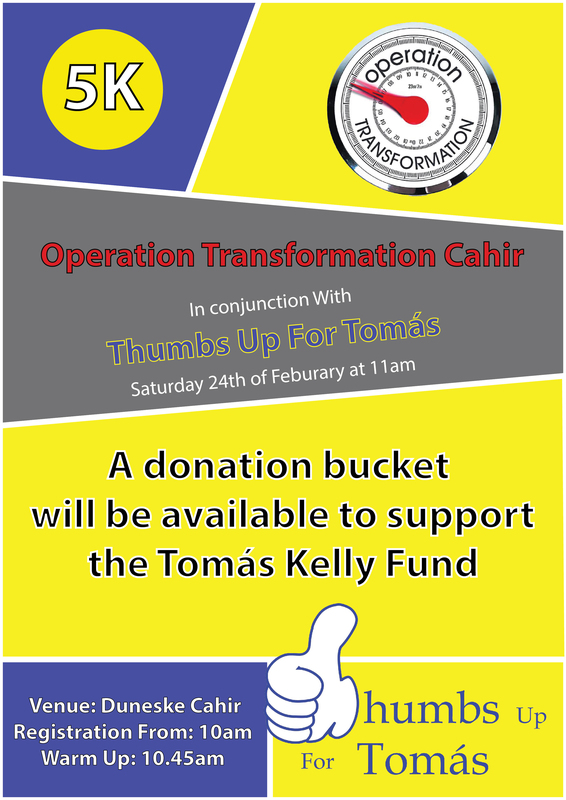 The 5km route for Saturdays Operation Transformation in aid of the Tomás Kelly Fund is to leave Duneske at 11am sharp and is turning left on the Clonmel Rd, then left again up Butler Court through the roundabout and down by Colaiste Dun Iascaigh. Turn right onto Cashel Road and head out past the Priest Road where you turn at stewards and head back in towards town. Cross over road at The Mart and make way into Town and up by the Library and home to Duneske by the Clonmel Road. Anyone wanting a shorter route can do the loop around the Colaiste and back into town. Runners to the front at the start and walkers, children and prams at the back. Everyone needs to register from 10am to 10.45am. Civil Defence, GardaÍ on patrol and Men's Shed and Tidy Towns stewarding. A donation bucket will be available to support the Fund on the day. It would be great to see a good turnout for this event.